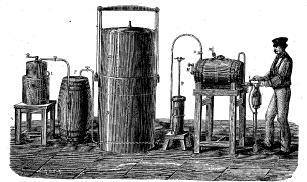 There, a suction & force pump compressed the gas and sent it to a huge saturator with a stirring system (the container was filled with the amount of water to be prepared with gas). Saline substances and ingredients were than added to the water, to recreate various natural mineral waters. These substances could be either added in the prepared water, or added directly (using powders) in the bottles. Water would naturally dissolve a volume of carbonic acid gas equivalent to the water volume; the pressure given by the suction & force pomp increased the saturation of gas in the water. . The water could then be extracted, and once the container was empty, the process could be done again. Gosse et Paul first prepared carbonic acid by burning chalk (carbonate lime). After some practice, they started to process the chalk with sulphuric acid, which when cold, produces carbonic acid. The obtained gaz was sent through wood containers full of water to get purified before entering a gas holder machine. In the early years of the 19th century, Seltzer water was considered as an authentic pharmaceutical product: as such it could only be delivered with a doctor’s prescription. In Geneva, manufacturing Seltzer water had become a real business. Two pharmacists, Gosse & Paul, created an outstanding and very elaborated system, which was then patented with the given name of ” appareil de Genève”.